Taxation is a crucial instrument for the realization of human rights, not just because it is necessary for ensuring sufficient resources to support rights, but also because tax policy plays such a fundamental role in redressing inequalities and in shaping just how accountable governments are to their people. Yet many countries struggle to collect sufficient revenue to fund public services essential for the realization of basic rights to health, education, housing, access to justice and an adequate standard of living. Meanwhile, unjust tax systems—at both the national and global levels—too often fuel rising inequality and widening disparities in human rights enjoyment, shifting the burden of taxation onto society’s least well-off and concentrating wealth in the hands of a privileged few. The inadequacy and inequity of tax regimes is also a growing issue in debates over implementation of the Sustainable Development Goals (SDGs). Domestic resource mobilization has increasingly been recognized as a key determinant of poverty eradication, while the role of large-scale tax abuse, including through the use of secrecy jurisdictions and corporate tax avoidance, in undermining development has become clear. For over a decade, CESR has been using innovative methodologies to trace the link between fiscal policy—how resources are generated and spent—and human rights fulfillment. Our research and advocacy has shown how unjust tax and budget policies are the major cause of economic and social rights deprivations in countries across the globe. 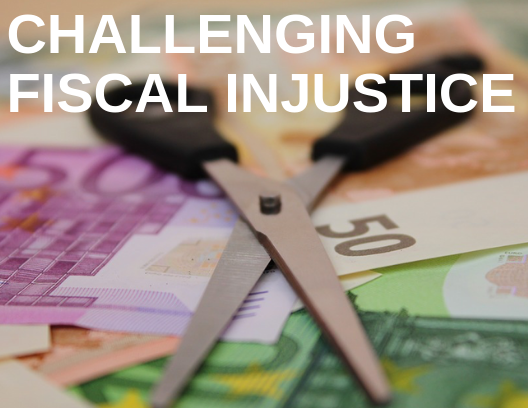 In countries such as Brazil, Ireland, South Africa and Spain we have documented the human rights impacts of harsh fiscal austerity measures, which have fallen disproportionately on disadvantaged groups, widening inequality. In transitional contexts such as Guatemala, Egypt and Colombia, we have shown how regressive fiscal policies undermine progress towards peace, democracy and sustainable development. In each of these countries, we have worked with national partners to bring human rights arguments and mechanisms to bear in challenging fiscal injustice, leading for example to progressive tax reforms in Guatemala and to the repeal of austerity measures in Spain. CESR has also challenged regressive corporate tax reforms in countries such as the United States that risk fueling a “global race to the bottom,” undermining human rights both domestically and internationally. CESR is part of the Steering Coalition of the Independent Commission for the Reform of International Corporate Taxation (ICRICT), an independent, nonpartisan group of global tax experts which seeks to reform the rules governing how multinationals are taxed, and by whom. CESR has been working for many years to foster alliances between tax justice, development and human rights advocates so as to broaden the advocacy base for fiscal justice and deploy human rights tools and strategies to bring about greater fiscal accountability. A landmark cross-movement convening led by CESR in 2015 resulted in the widely-endorsed Lima Declaration on Tax Justice and Human Rights. As well as being part of international networks such as the Global Alliance for Tax Justice, CESR also works closely with feminist advocates to fight for progressive fiscal policies as a critical tool in the realization of gender equality and women’s rights. CESR’s work has enabled numerous human rights bodies at the national, regional and international level to engage more effectively with tax and fiscal policy, assisting them in scrutinizing how governments use their “available resources,” developing methodologies for assessing austerity, and bringing evidence before regional bodies such as the Inter-American Commission on Human Rights—part of a CESR-led initiative in Latin America to develop principles and guidelines on human rights and fiscal policy. At the same time, CESR also brings human rights arguments to international development advocacy spaces with influence over fiscal policy, such as those of the International Monetary Fund (IMF) or the High Level Political Forum on Sustainable Development. As we look to the future in a world wrought with increasing inequalities alongside increasing resource scarcity, tax and budget justice is sure to become an evermore urgent issue. CESR and its partners will be working closely to unleash the powerful potential of a human rights-centered approach to fiscal policy. Policy-makers have played Jenga with the broken international corporate tax system for some time. It’s time to build a new foundation for effective taxation of multinationals. U.N. poverty expert Philip Alston's report on U.S. poverty reflects CESR concerns about effects of tax cuts on human rights and inequality. UN expert body takes new steps to prevent corporate tax abuses, but more is needed to ensure companies pay their fair share. Press release: Switzerland has received stern recommendations from the UN’s women’s rights treaty-monitoring body over the impacts of its role as a tax haven.